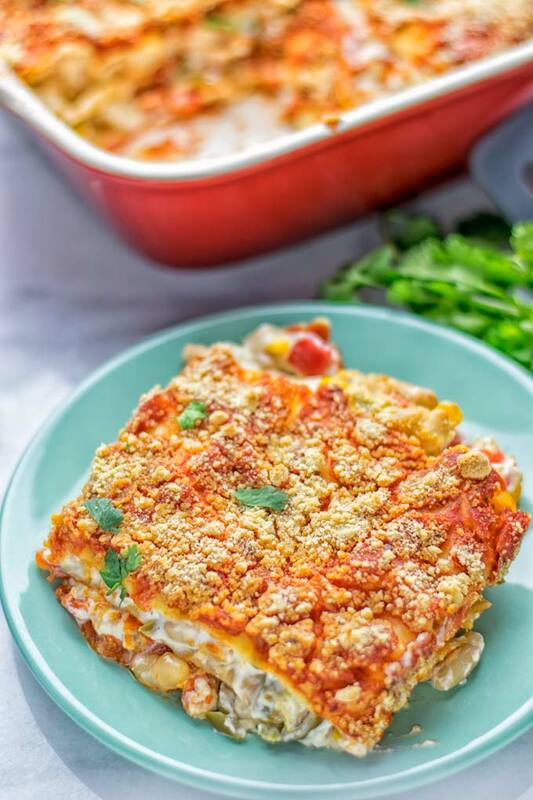 This amazing White Chili Lasagna is entirely vegan, gluten fee, and so easy to make. A stunning lunch or dinner, ideal for meal prep and work lunches. 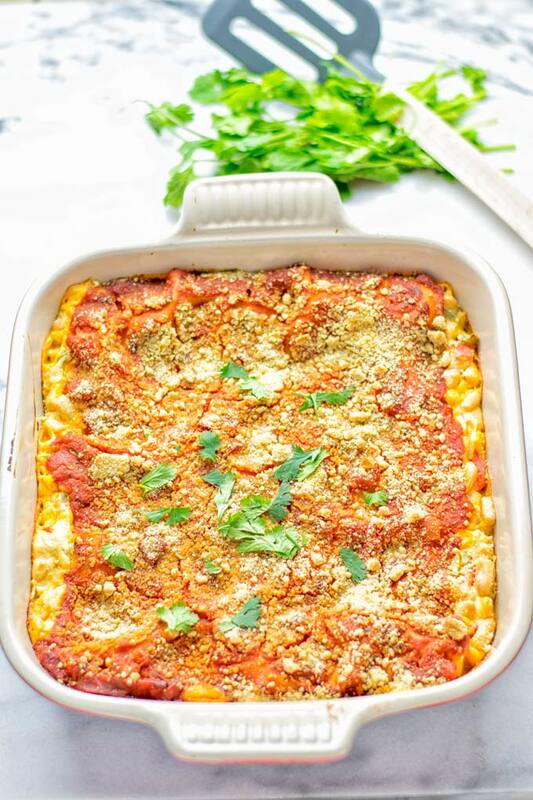 Lasagna is something that I have a craving for all year long, like for this instant hit Buffalo Cauliflower Lasagna. 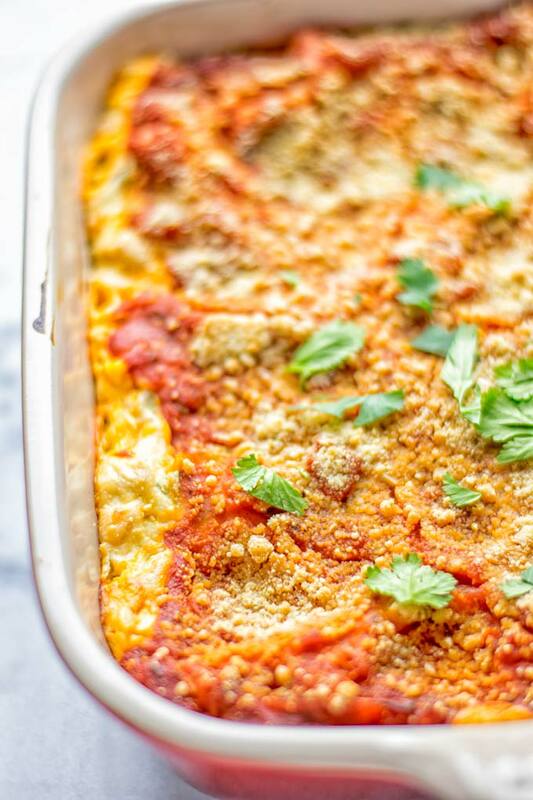 If you’re looking for more easy and delicious lasagnas that are all plant based and gluten free, look no further. Use the search bar and type “lasagna”. creamy, comforting, warming, filling, hearty, addictive, flavorful, perfectly and a must make for everyone who wants more delicious food in their life. White chili is often made with cheese, heavy cream, cream cheese, butter and chicken. To keep it all plant based, we do something different. I simply use vegan cream cheese which adds a lot of creaminess. For the spicy kick, I went for jalapeños and also add a white chili homemade seasoning. So good. For the perfect texture feel, I simply add white beans. My Vegetarian White Chili is super easy to make in one pot and so delicious. If you haven’t already tried it, it’s time to change you won’t miss that. As I mentioned before my Vegetarian White Chili which is entirely vegan, gluten free is super easy to make in one pot. Start with a large pot and add a bit of oil or vegetable broth, if you’re more into oil free cooking. Add garlic, optional onions and bell pepper, and fry for around 5 minutes. Next, add vegetable broth, vegan cream cheese, white chili seasoning plus jalapeños for the right kick. Let simmer for about 10 minutes. Finally add beans and optional corn and the mixed tapioca or potato starch (starch + 2 tsp water). This will help thicken the chili. Note: It really needs the starch to thicken up, otherwise it doesn’t have the right texture for the lasagna. I’m a guy that really likes spicy food, so for me it’s the perfect flavor match. If you’re sensitive to spiciness, please make sure to scale down. Don’t use the whole required amount of jalapeños. Instead use 1/2 or 1/4 of the quantities. Same for the white chili seasoning. Scale down, use less if you need it a bit milder. On the opposite you can spice it up add more seasoning or more jalapeños. Use a large casserole. I recommend a 10×10 casserole dish for lasagnas. I always use no boil lasagna noodles to keep it really simple. So please make sure you are generous when layering with sauce. This will help them cook easily. If you can’t find no boil lasagna noodles, you can use regular noodles but you need to pre cook them. Make sure to check the manufactures directions. You will need a 10×10 inch casserole dish. 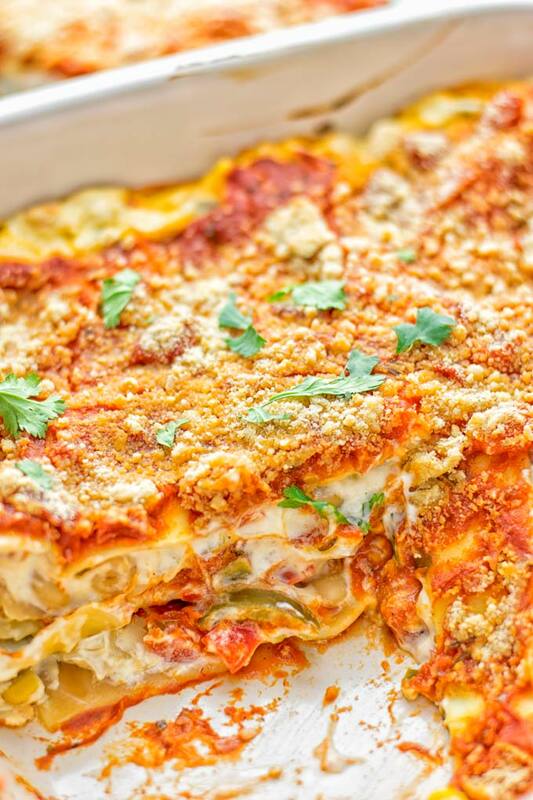 Start with a layer of marinara, followed by lasagna noodles and white chili. Sprinkle a bit vegan parmesan, optional, if you like. Repeat these steps until no chili and marinara are left. The last layer should be marinara. Again sprinkle a bit vegan parmesan if you want, totally optional. Bake everything covered with aluminum foil on top for around 15 minutes at 415°F. Remove the foil and bake 10 minutes longer, lastly divide on plates or bowls. 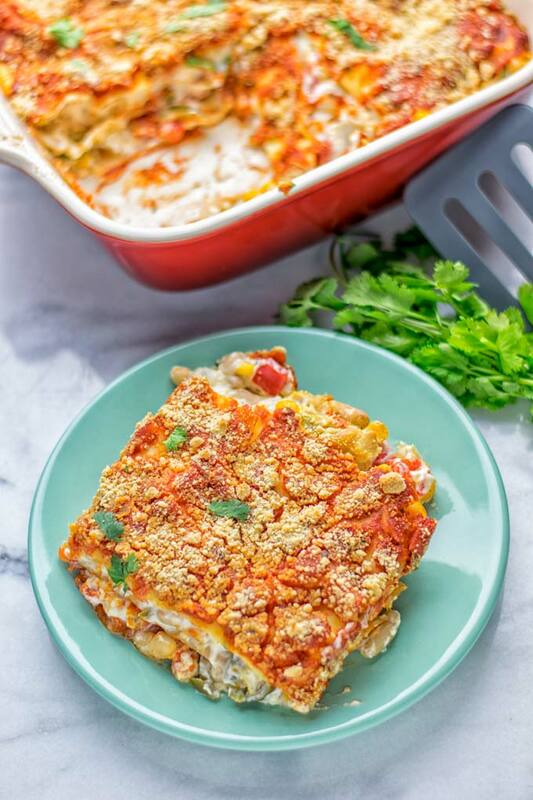 My White Chile Lasagna makes an amazing, dinner, lunch, meal preparation, work lunch for everyone. 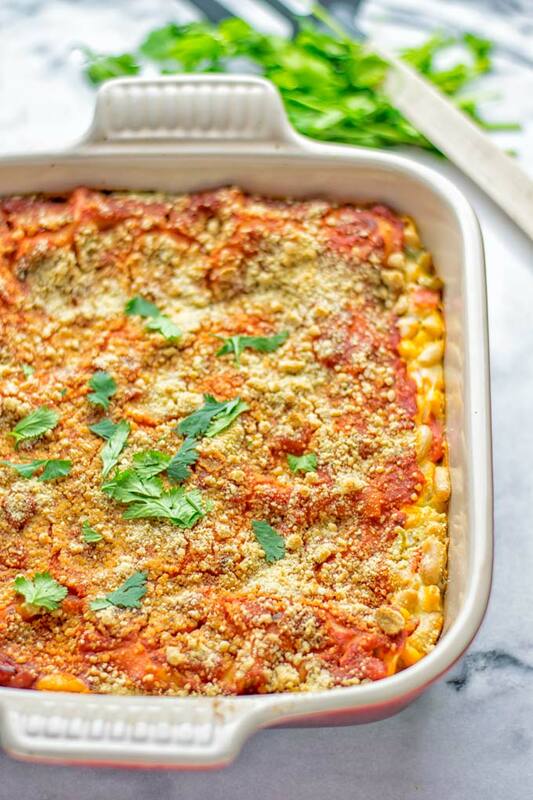 Also fantastic for quick weeknight family dinners. 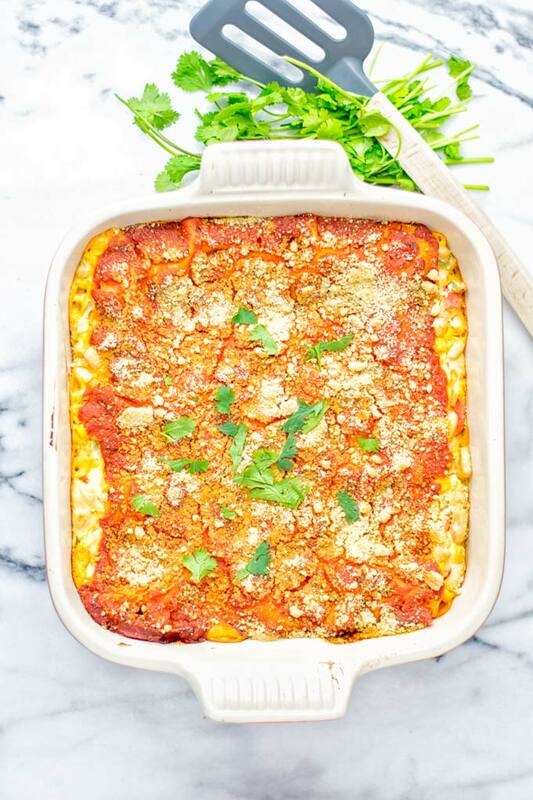 Of course it’s also made for date night, who does not love lasagna? See everyone would agree, it’s the ultimate comfort food. 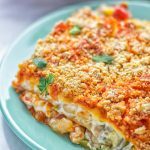 What makes this White Chili Lasagna so amazing is the flavor contrast between the chili and the marinara. It just makes everything better. I made this 3 times recently and I can happily confirmm, I never get tired or bored of it. Everyone loves it, even my meat eater friends. There was no missing meat. Must be the white beans which add so much filling and texture to that dish. 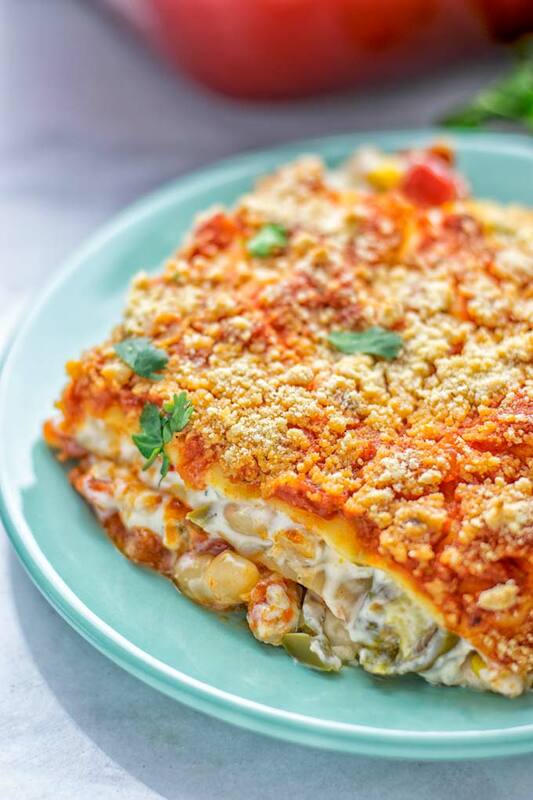 If you give this White Chili Lasagna a try, tag me on Instagram or Facebook. Don’t forget to add a snapped picture so I can see all your amazing remakes. When making the White Chili, add mixed tapioca or potato starch (starch + 2 tsp water). This will help thicken the chili. I love the White Chili so I didn’t know if I wanted to change it but… I tried it. Yum! Even my non-vegan husband went back for seconds! Once again, thank you! Thanks for your fantastic feedback, Denise! Glad it was such a big hit with your husband!